While in Oregon we caught up with Professor Margaret Richardson who teaches History of Modern Design at Portland State University. Ms. Richardson, an eloquent speaker and author on art and design since the early 1980’s, has written for publications including Print Magazine, How, and U&lc and wrote Type Graphics (Rockport Publishers), 2000. 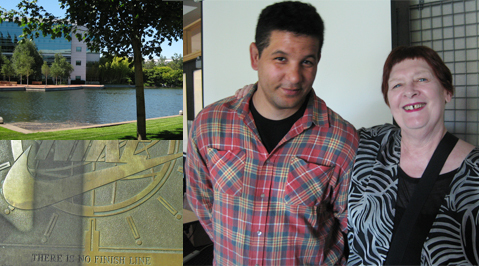 Professor Richardson generously invited us to join her summer session students on two class trips, Flint Design and the Nike World Headquarters in nearby Beaverton. Flint Design, owned by Catherine Healy, is located inside a nicely converted industrial building in the Pearl District of Portland. The firm specializes in packaging, servicing a number of local food manufacturers (the well-known Tillamook Creamery, Nancy’s Yogurt) and wine and beer producers, (Kona Brewing and several Willamette wineries). Catherine and her small band of designers offer a complete service flow: research, naming, identity, packaging, branding and marketing. On the Tuesday after the 4th of July weekend we again joined the class, this time at the epicenter of the sports behemoth, Nike. The 200-acre Nike headquarters is hidden from public view, completely surrounded by a high earthen berm that is backed by dense rows of mature evergreen trees. The implication is clear—random visitors are not invited. One enters an arched gateway identified only by Nike’s red swoosh. The main entrance had a Taj Mahal like approach— centered upon a long rectangular pool of water. The campus unfolds ahead of you in a series of buildings, each named after a sports legends, (Tiger Woods, Mike Schmidt, Nolan Ryan, etc) surrounding a small lake. Sculptures and artwork abound. Everything is manicured, well maintained, and sparklingly rich. We joined the class as they assembled in the Nolan Ryan building and were met by a PSU graduate and current branding director for Nike Action Sports, Damion Triplett. Damion guided us into a conference room where he introduced us to the work in his division—one of Nike’s smallest categories with “only” about 140 team members and 500 million in sales after almost 10 years of carefully building their brand. Mr. Triplett described their target market (snowboarders, skateboarders, surfers and BMX bikers) along with the challenges he faces compared to the more conventional sports divisions of Nike. Action sports clients are by nature, edgy and hip risk-takers, rapidly picking up and discarding trends. Because the entire process of product development and launch can take up to two years, Triplett and his team must be a combination of trend-spotters, design innovators and soothsayers. Triplett described a two-pronged approach to their marketing. One is periodic releases of short run collectible shoes that are only carried in smaller “mom and pop” stores. These releases are supported by special point-of-purchase displays—(he showed us an example of a hand-painted risers used for shoe display). High performing athletes, such as skateboarder Eric Koston, have been signed to endorse these limited editions. The second involves mass-market campaigns targeted across the entire action sports category. We viewed a number of the upcoming commercials, all featuring ‘rock star’ action sports figures but no product, only a Nike logo in the closing frames. The team was gearing up for the Nike sponsored US World Cup of Surfing (the 2011 events concluded in August), an event that attracts tens of thousands of board shorts/bikini clad youth. It is likely that the event offered Damion a fair share of opportunities for surfing through his own problem solving. The celebration of the Swoosh anniversary included the release of 28-page booklet exclusively for “the benefit of Nike employees” but you can see it online at a number of sites, Slam online and a Steven Heller article , the complete logo story can also be read online. 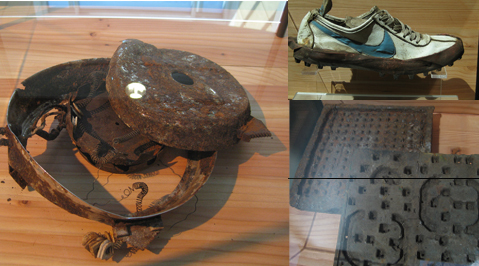 The handsome centennial exhibit centered around a vitrine that held the original waffle iron used by Bill Bowerman to create his new, lightweight running shoe sole. Most of the shoe prototypes on exhibit were thought to have been lost but were unearthed during a construction project at Bowerman’s former home and workshop. The DNA staff were conducting a number of guest tours but when free they were very helpful in answering questions and offering information. The campus is not open to the general public but someone made a YouTube video which gives you a better idea of the facilities Finding America. 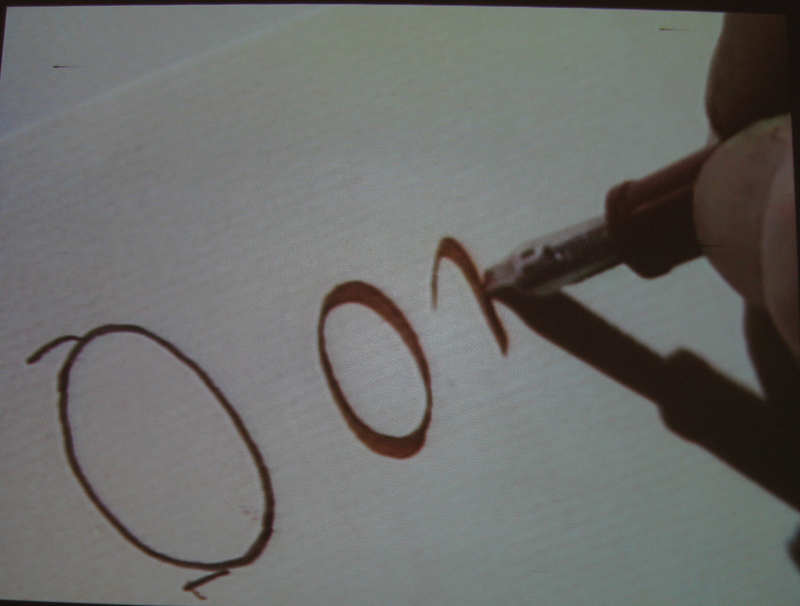 Reynolds started teaching at Reed in 1929 but concentrated on calligraphy from 1949 through 1969. Some of the most influential type designers of the early digital era, including Sumner Stone and Chuck Bigelow, were introduced to letter design in Reynolds’s class. 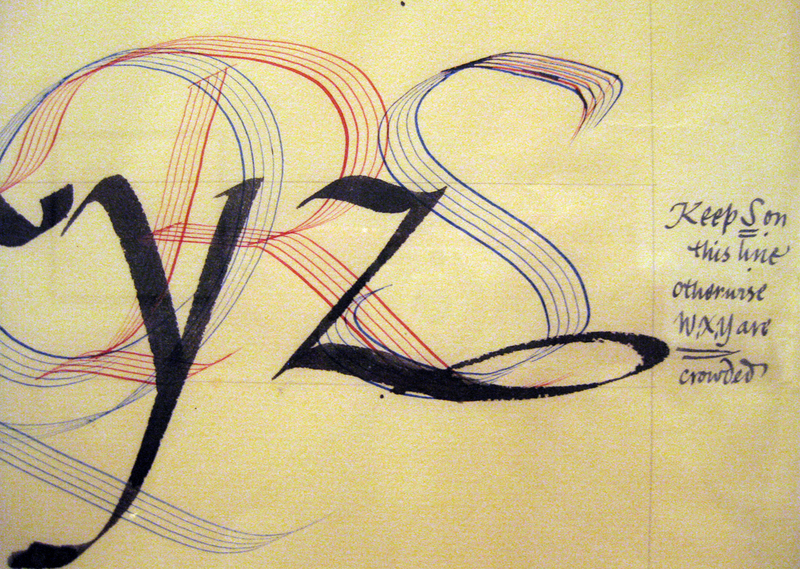 Reynolds built up an international reputation, was awarded many honors and starred in a 20-part series on italic calligraphy for public television. One of the episodes was playing on a large screen in the exhibition which was wonderful because you got to see the man in living action. A YouTube video clip discusses rhythm and gives you an idea of his thoughts on writing. 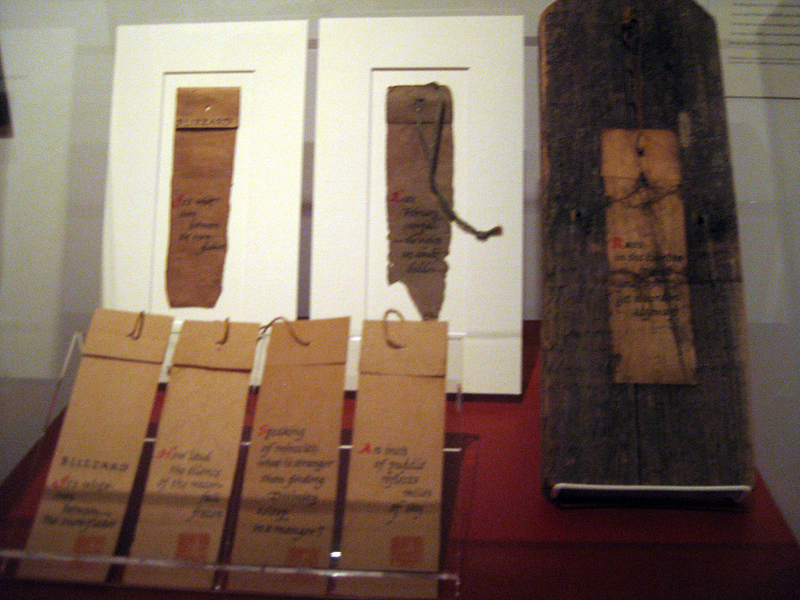 Reynolds also invented an improvisational calligraphic form he named “weathergrams.” These were haiku-like poems (10 words of less) drawn with ink onto small pieces of brown kraft paper. The weathergrams were hung on campus trees and allowed to weather through an entire season. Our whole trip was 10 days but it flew by like a weekend. There is so much to see in Portland and the surrounding area. Luckily the next week we were at Wells College (in the finger lakes region of Aurora, New York) taking a summer class with Portland School of Art professor and master printer Barbara Tentenbaum. 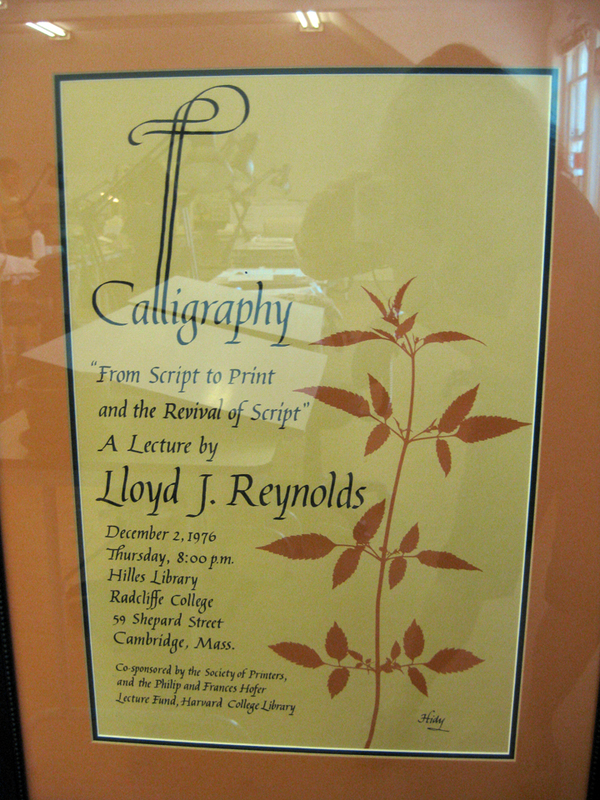 Although we’ve attended the Wells Summer Intensive several times previously, this time our eye was caught by an old poster (lettered by Lance Hidy) advertising a lecture by Reynolds at Radcliff in 1976. Small world.